Blinds may be fitted either inside or outside the window recess. 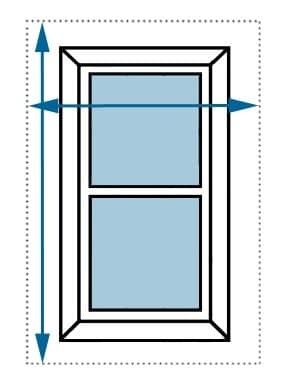 The blind should be fitted outside the recess if the recess is less than 7.5 cm (3") deep; the window opens inwards; or if the window is not straight (ie if the width or drop varies by more than 2 cm). Measure the width and the drop inside the recess, in at least three positions, taking account of any protrusions such as tiles and dado rails. 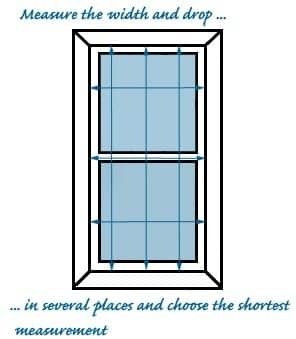 Be sure to measure into the corners as this measurement is quite often smaller than the rest of the window opening. Use the smallest width and drop measurement to ensure the blind will fit. Remeber to choose 'recess size' on the order form. If a blind is being fitted outside the recess, please quote 'blind size' on the order form and the blind will then be manufactured to the size quoted. Each window is different and should be treated individually, but as a rough guide, allow 5-10 cm either side and below the window and 10-20 cm above the window. In order to comply with safety standards designed to minimise the danger of child strangulation, blinds must be fitted with the bottom of the chain no lower than 150cm from the ground. So we also ask for the measurement from the top of the blind to the ground. Several Blinds in the same window? If more than one blind is being fitted in a window please quote the size of each individual blind rather than the overall recess size. If you are fitting blinds into a bay window and need some measuring advice, please call us!